At the Garlic Planting Party this past Sunday, we enjoyed a beautiful fall day in the field, chatted about the season and the CSA, ate delicious roasted garlic, chili, vegetables and bacon dip, drank cider, and somehow got a whole lot of work done also! We are so happy to have shared the day with some of our CSA members, and we hope more of you will be able to come out next year. Many hands made light work and we planted three of our ten varieties of garlic. We began with three rows of Russian Giant, a purple-striped hard neck variety with huge cloves (which you may have recently seen in the share and at market) and then we moved on to Siberian, an equally large, marbled purple stripe variety, and Chesnok Red, a fiery and hot standard purple stripe. We separated the heads for all the hard neck varieties, sorting them by size: large cloves that will produce sizeable heads and smaller cloves or double cloves to roast and eat. Members and friends helped to push the cloves approximately 2 inches into the ground, six inches apart, and to rake soil over top of them. Later, we will mulch with straw to insulate them from the cold, maintain moisture, and to suppress weeds. When you plant a clove of garlic, the root comes from the bottom of the clove, where it attached to the head, and the tip of the clove becomes the shoot. That one clove will develop into the fibrous stalk in the middle of the head, and new cloves will grow around it. Garlic planted in fall will begin to sprout a root, hopefully just enough to keep it from “heaving” out of the soil when the ground freezes. It will sprout more in the spring, eventually growing the long curly garlic scape you remember from earlier this season. We pick off the scape to encourage the plant to put more energy into developing a large head. Then, when the plants begin to die back in early summer, we watch and wait until 2/3 of the leaves have yellowed. That is when we know it is time to harvest. We pull the plants and hang them to cure, providing good air circulation, which dries the wrappers of the garlic to ensure proper storage and flavor development. Then, we count out and set aside some of the harvest to save for seed for the next season. Last, we eat it – in everything!! Members and farmers market shoppers have been asking – can I plant garlic I buy from Colchester? The answer is yes! Organic seed garlic from seed companies can run up to $20/lb. 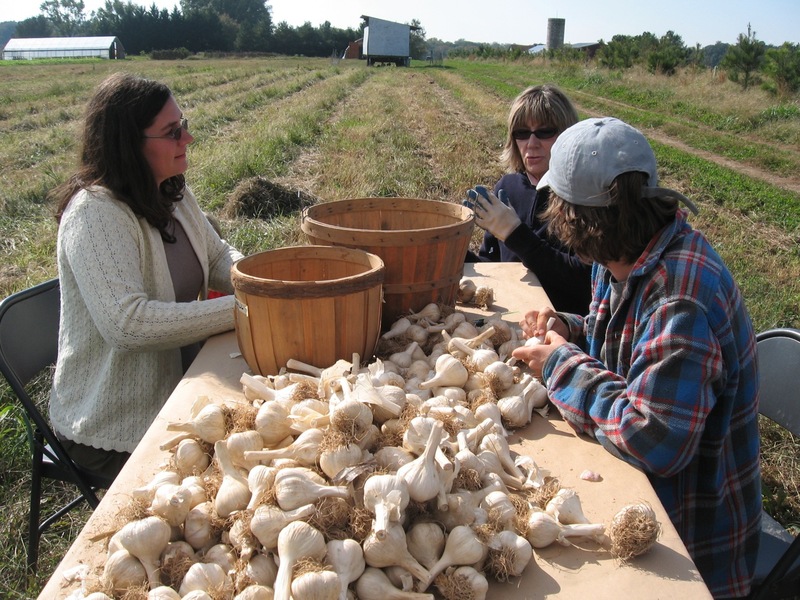 Our garlic is not certified organic, or certified disease free, but we use no chemical pesticides or synthetic fertilizers, and the heads seem healthy enough that we choose to plant them ourselves at the farm. Over the years, we have grown, saved, and replanted these varieties of garlic to increase our stock from only a few heads purchased years ago. We’re happy to answer questions about the garlic growing process. Spice up your garden – plant some of our garlic in it! Here is the easiest ways to enjoy garlic. We like it because it really features the garlic’s flavor, and because of the simplicity of the recipe. Pre-heat oven to 400 degrees. Place cloves of garlic (still in their wrappers) in tin foil packets. Add olive oil to coat lightly, and some salt. Roast the garlic for 30 – 40 minutes, checking towards the end to see if they have softened. Allow to cool, and then enjoy! We like to bite the cloves out of their wrappers like you would an artichoke. Some people like to squeeze the cloves from their wrappers onto bread. You can also puree garlic roasted this way and add to soup, or hummus, or pasta, or … almost anything else. You can also try this with different varieties and see if they taste different to you. These are cooler days, when we only sometimes take off the layers we bundle on in the early morning. Fall also brings time for reflection. What a season this has been so far! Even with extreme wetness and extreme heat, this has been an abundant season. Remember peas and the early season head lettuce? As the tomatoes wind down, I remember when we had so much more than we could eat. Let’s celebrate together! Please check out our upcoming events. Mark Your Calendars — Here are the Upcoming Events! On Friday, October 14th 4-6pm we will hold a Pick Up Party! Bring friends or family out to the farm, eat some snacks and/or take a tour of the fields. There will be spots to sit and talk, some music, and we can all enjoy the farm in fall. Then, on Sunday October 23rd, come to the Garlic Planting Party! Garlic is planted in fall, and then it stays in the ground over the whole winter and grows in spring for mid-summer harvest. We will plant 10 varieties this year! There will be hot drinks and roasted garlic to eat on bread. If you want, feel free to bring friends, or food or drinks to share. Some of us will sit around tables and break apart the cloves of garlic, sorting the big single cloves for planting. 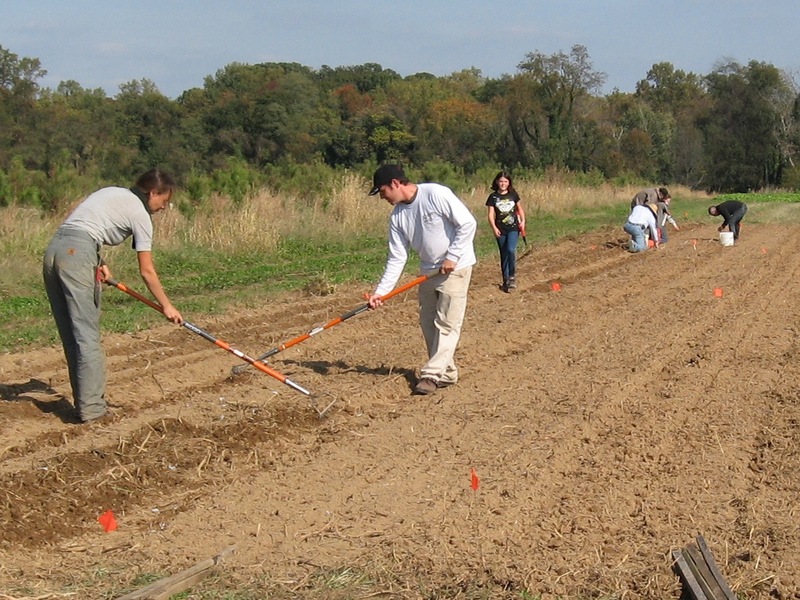 Others will help in the field, placing the cloves in the rows. There will be something for everyone to enjoy. Hope to see you there! One of our goals for next season is to reach our full capacity of 150 CSA members. Please help us! Check out the upcoming events and, if you want, think of them as “friendraisers.” Bring neighbors, family, friends … anyone you think might be interested in joining the CSA. We’ll help you to share the farm with them. Hopefully exposing them to what we’re about will help them think about whether joining would be a good fit. With the change in temperature, come tasks of planning for next season, building a new high tunnel, and figuring out the budget. We hope that for you, too, fall is a time to appreciate this CSA season and to plan for the next one. 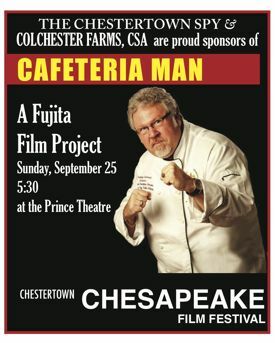 Will you join Colchester again for 2012? If you can – please sign up this fall! There will be sign-up forms soon at upcoming pick-ups. Members signing up in the fall is vital to supporting the CSA. When you join in the fall, your commitment can buy seed and other supplies for next year, and help to fund some necessary equipment improvements. Membership forms are also available here as a pdf.